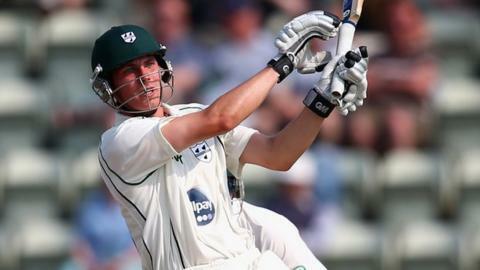 A career-best 133 from Tom Fell gave Worcestershire a narrow edge against Glamorgan on day one at New Road. It was a sombre day for the home side following the news of the passing of Academy director Damian D'Oliveira. Fell, 20, shared a 168-run fifth wicket partnership with Tom Kohler-Cadmore (60 not out) who overtook his previous top score of 56, set just 12 days before. Michael Hogan (3-54) starred with the ball for the visitors as the hosts finished the day on 266-5. Glamorgan fast bowler Ruaidhri Smith, who also plays Minor Counties cricket for Wales, coincidentally played in Worcestershire debutant Richard Oliver's last game for Shropshire earlier in the month - at Pontarddulais. Opener Richard Oliver, signed from Shropshire on a year-and-a-half-long deal following a successful trial in Twenty20 cricket, made 13 on his first-class debut before becoming the first of Hogan's three victims. The other two wickets were claimed in the space of three balls by teenage fast bowler Ruaidhri Smith, who also played in Oliver's last game for Shropshire earlier in the month. The Scotland-born, Shrewsbury School-educated Smith, 19, who has come though Glamorgan's development programme and also plays Minor Counties cricket for Wales, claimed the two key scalps. After removing new England Test star Moeen Ali, who top-edged a pull well held by Chris Cooke, running towards backward square leg, Smith then quickly struck again when he had Daryl Mitchell caught in the gully. But Fell, with the help of 19-year-old Kohler-Cadmore, patiently shored things up with his second consecutive Championship century, having made 124 in the win over Leicestershire at Grace Road. "I have a lot of fond memories of Damian. When we found out and told the lads, it was very tough, and through the minute's silence as well. "It was difficult at the start but the way the two lads - one 20, the other 19 - fought back with their partnership was fantastic." "With seven of his Academy discoveries playing in this match, it shows that Dolly had an eye to spot talent." "It is fitting that on the day Damian D'Oliveira's death was announced that two of his proteges rescued the Worcestershire innings. "Tom Fell's second century in consecutive games was hard earned against a Glamorgan opening attack that did well on a fairly flat pitch, although a couple of the Worcestershire batsmen played shots they might not have been too proud of. "Tom Kohler-Cadmore played an out-of-character innings to give Fell valuable support and. if the ball does begin to turn later in the game, a first innings total of around 400 would be more than useful."